The ELSA 8RN is an open circuit, compressed air constant flow, escape breathing apparatus comprising of a high pressure compressed air cylinder, a combined cylinder and pressure reducing valve which supplies air to an air hood via a length of hose. 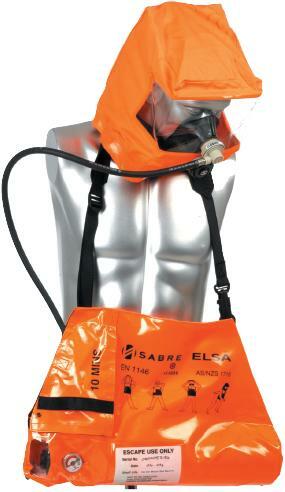 The apparatus is supplied within a high visibility carrying bag with sling. COMPRESSED AIR CYLINDER - The compressed air cylinder is manufactured from alloy steel to BS 5045 part 1 and is of 1.0 litre water capacity. When fully charged to 200 bar , the cylinder provides a free air capacity of 200 litres, which will provide a minimum nominal duration of 8 minutes when, supplied at a constant flow of 22 litres/minute. The cylinder neck thread is 0.715" taper thread to BS 341. CYLINDER / PRESSURE REDUCING VALVE - The combined cylinder and pressure reducing valve screws directly into the cylinder and operates using a simple, spring-loaded piston mechanism. High pressure air from the cylinder is reduced in pressure to approximately 6.9 bar (100 psi) which in turn is fed to the air hood supply hose through a flow restrictor. A bourdon tube type pressure is fitted to the valve, which provides a continuous reading of the cylinder pressure. The valve is actuated by rotating the knob on top of the valve anti-clockwise, which in turn allows the spring beneath the piston to push the piston away from the valve seat and allow air to pass through the valve to the supply outlet. When the pressure above the piston increases above the pre-set level, the spring will be compressed thus closing off the air from the cylinder. This cycle operates at a high frequency and is self regulating and automatic in operation. To close the valve, the knob is turned clockwise which in turn bears down on the piston which closes off the air from the cylinder. A charging adaptor with integral non-return valve permits recharging of the cylinder via a special adaptor. The valve body and components are fabricated from nickel plated brass with a stainless steel spring, various rubber seals and a moulded nylon handwheel. AIR HOOD AND SUPPLY HOSE - The supply hose is connected to the flow restrictor fitted to the pressure reducing valve outlet. The hose is made from Neoprene and has a minimum burst pressure of 16 bar. The supply hose screws onto the air hood diffuser using a knurled finger coupling with O-ring seal. A stainless steel wire silencer is fitted into the supply hose to suppress the noise of the air entering the air hood. The airhood is fabricated from PVC and features an elasticated neck-seal and a polyurethane visor. A moulded nylon diffuser is fitted to the front of the hood to direct the airflow across the visor, to aid demisting. CARRYING BAG AND SLING - The carrying bag is fabricated from a high visibility, flame retarded PVC material and is fitted with a flame retardant polyester webbing sling. The bag can be worn slung around the neck with a chest strap providing additional security. The cylinder is carried within the bag with the pressure indicator constantly visible. A lift flap provides protection for the hood whilst stowed and yet immediate access in the event of an emergency.